With millions of MacX DVD Ripper Pro now in use, MacX's customer satisfaction is at an all-time high. However, as our customers are using the DVD ripper to copy and rip tons of discs bought from different studios, there are going to be issues. The company's increasing success means that there won't be any major issues or design failures to work as advertised, but a few users can ran into one small but nasty error, one that they may avoid. This post offers official fixes to most common problems with MacX DVD Ripper Pro, like MacX DVD Ripper Pro not ripping entire movie or not opening, keeps crashing or quits unexpectedly. No.1 fast DVD ripper with Intel QSV tech, 5 minutes for a full HD rip. Support 99-title DVD, new movies discs, TV shows DVD, workout, etc. Rip DVD to MP4, MKV, AVI, 200+ formats and 350+ mobile presets. Gain a 98% customer satisfaction rate among users. Have an average rating of 4.2 to 4.5 stars out of 5 on pundit sites. 1. If you've updated to macOS High Sierra or Sierra recently, please free download the latest version of MacX DVD Ripper Pro at: https://www.macxdvd.com/mac-dvd-ripper-pro/. 2. Uninstall the software or programs updates from the last time when the DVD ripper still worked. 3. If you're running on Yosemite or earlier, the problem may be caused by is a disk permissions error, to fix this: launch Disk Utility > select First Aid > select volume > click Repair Disk Permission. Another most-complained problem is that MacX DVD Ripper Pro not ripping the whole DVD movie. Unlike those not ripping entire movie problems with other ripper like HandBrake, which may shows 0.01% and immediately says encode complete (to fix the problem, you can try to switch 4GB to Large File Size, or it will be a common error to rip protected DVD with Handbrake), the MacX DVD Ripper Pro may stop rip the movie at half or certain part of the movie. First, if you're constantly being allowed to rip the first 5 minutes of a movie, that may be because you're using the trail version, which imposes a limit to allow 5-minute ripping only, or you haven't upgraded the software correctly. If so, free download latest version. 1. There might be bad sections or data damage on the DVD. You can cut the corrupted part with its trimming feature and continue ripping the rest movie. 2. MacX DVD Ripper Pro won't rip whole DVD if the disc is scratched or damaged. So check if the DVD disc is fine and take necessary measures to alleviate. If you're at lost, check the guide on how to copy damaged DVD. 3. Check if you've set your computer to Sleep Mode. When the drive goes into sleep mode and stop working, MacX DVD Ripper Pro can't write data anymore and will cause not ripping whole dvd error. Go to System Preferences > Energy Saver and slide the sleep to Never or select "Prevent computer from sleeping automatically when the display is off". 4. Switch to DVD to ISO backup mode to make an ISO copy first. Then convert the ISO files to the format or device you originally want. This will solve any problem caused by intact DVD information. 5. Check if there are any hardware problems like CPU overheating. Handbrake users may crash often whenever they manage to rip protected DVDs, as the free DVD ripper lacks the ability to deal with encrypted discs. Also, there are some users experiencing MacX DVD Ripper Pro freezing, crashing or quitting unexpectedly problem with certain discs. But the causes to MacX DVD Ripper Pro crashing are different to that to Handbrake or other rippers, and those problems can be solved. 1. 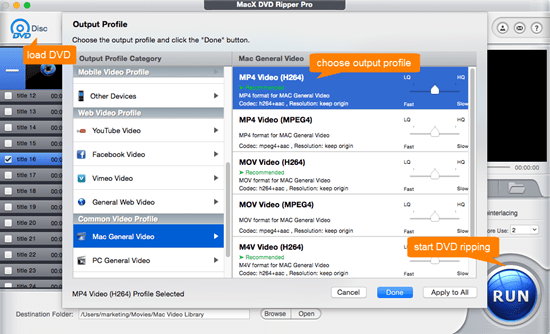 MacX DVD Ripper Pro is able to remove most popular copy protections. When MacX DVD Ripper Pro keeps crashing or gets stuck with tough discs, like the movie I Am Wrath, check the Safe Mode box on the bottom right corner of the interface, which will solve most MacX DVD Ripper Pro not working problems caused by strong DVD protections. 2. Handbrake is very CPU intensive which may result in high CPU temperature. The ripping can keep all 4 cores running at 95+% usage and have Handbrake come to crash. MacX DVD Ripper Pro support Intel's QSV tech to speed up the ripping, while you can selectively choose the number of cores for the ripping from 1 to 8 with its multi-core CPU feature. There are users have problems when they rip DVD with subtitles, reporting MacX DVD Ripper Pro with missing subtitles problems. For example, "I'm using MacX DVD Ripper Pro to rip a burned-in DVD to video files such as QuickTime or AVI. However, the software will recognize all the subtitles (Nepalese, English, Spanish, Portuguese, Swahili, and French) except Amharic. I try Handbrake, it doesn't work either." 1. For most DVD rippers, they can recognize more common languages; MacX DVD Ripper Pro is no exception. If you're using MacX DVD Ripper Pro with no subtitles in certain language, you can rename the Amharic subtitles to English. If you're ripping a purchased DVD with multi-pile languages, make sure you have checked the Forced Subtitle option. 2. Select copying DVD to ISO files, it will make a 1:1 copy of the full information in the disc, including the video, audio, subtitles, and other data. Then you can convert the ISO files to see if it contains the subtitles. If your problem with MacX DVD Ripper Pro can't be solved with the above fixes, please contact our support team. One to one support service will be provded to solve your problem. Windows version (32/64-bit Windows 10, Windows 7 and earlier are supported). Step 1: Insert the DVD into the drive of the computer. Launch the DVD ripper and click Disc button to load the DVD. Step 2: When the DVD is loaded, you will be taken to a window with output formats and presets. Choose the output file or destination device to play the DVD on. And click OK. Step 3: Make adjustment to the output video if necessary like trimming, cropping, watermark adding, editing etc. Then set an output folder to save the ripped DVD movie. Step 4: Now simply click RUN, the ripper will start ripping at fast speed. Tip 1: For those who don't know much about the formats or codec thing, you are suggested to rip DVD to MP4, it has good quality and relatively small file size, and it's widely accepted by mobiles, players, online sites. Tip 2: if the ripped DVD movie is too large for your device, considering to cut the unnecessary parts with the editing features, like the commercials in the middle, or black bars, or lower the resolution etc. Tip 3: After you rip the DVD movie into iPhone, iPad or mobile devices, you will need a way to manage the video files on your portable devices, in which case MacX MediaTrans will help. The iPhone manager offers an one-click solution to transfer, manage and backup your iPhone movies and media. Tip 4: When you have foreign films but prefer hearing the actors rather than dubbed English, you can choose either the original and dubbed audio tracks, and also the respective subtitle tracks. Tip 5: By selecting multiple audio tracks in the Audio pane, you can have your choice of audio tracks at the cost of a larger file. While both MP4 and MKV will pass through DTS sound, MKV will ahve more robutst audio playback options. MacX DVD Ripper Mac Pro has strong ability to allow uers to freely rip commercial & homemade DVDs to DVDs to MP4, MOV, M4V and more formats with high quality reserved. It's not flawless but has lower error rate than most other rippers on the market.